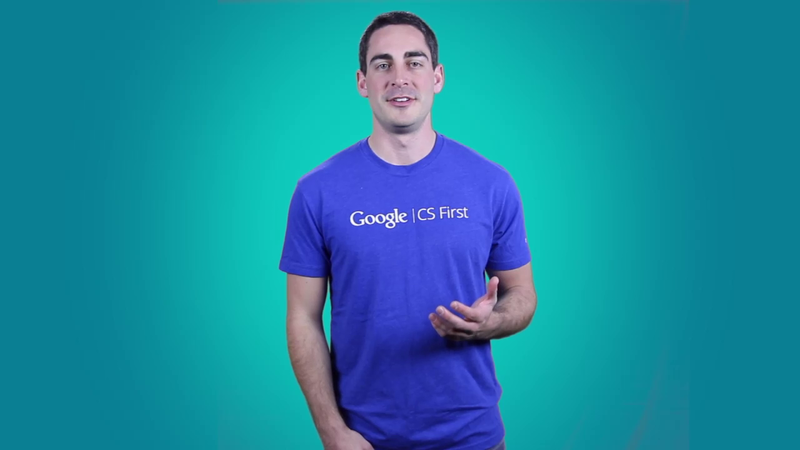 Hey team, welcome to Activity Two of Google CS First Sports. Get ready to channel your inner sports anchor voice while programming athletes to do some cool moves. In this activity, you will build a competition project while you learn about the computer science concept events. An event in computer science is something that makes an action happen. Events in scratch start with the word when and they're placed at the top of the block stacks to make the code start running. Events in computer science are a lot like events in your life. For example, when the bell rings at the end of the school day, you leave school or you go to an after school club. The bell ringing is an event. Your reaction is to leave school or go to an after school club. You can also find events in sports. For example when a basketball player steps out of bounds, the ball is turned over to the opposite team. Seven points in the game and out of bounds is Los Angeles gains possession. In the games shown, computer scientists like you use events to model those occurrences in a game. The when flag clicked block used in activity one causes something to happen when the flag gets clicked. In this activity, you will use events to make athletes perform while a commentator talks about the performance. From here on out, every activity you do will offer a couple starter projects with different sports themes to choose from. Pick the sport you like most! The example may not always show the sport you chose, so if the video says to click on the tennis ball sprite but you chose a volleyball starter project, just click on the volleyball sprite instead. For this activity, choose a starter project from these four options. Cheerleading, dance, karate, or basketball. Each project includes athletes in different poses. Click on the starter project link next to the video for the sport you choose. It will open another tab. Then, sign into Scratch using the information from your CS First passport. Most starter projects contain more sprites than you need to do the activity, so you get to choose the ones you like. This project contains several commentator sprites. Pick one commentator sprite that you want to program and delete the other sprite. After you open the starter project and choose your sprites, come back to this CS first tab and then click on the next arrow to move onto the next video. First, click on the starter project link. Then, click Remix, return to this tab and press the next arrow to move onto the next video to program your athletes' routines.